Japanese Bantams have a calm, trusting, friendly personality. They will ride on a shoulder, sit in a lap, and submit to petting. Although docile as individuals, the roosters will fight if they find too many of them in the same flock. The hens gently brood and protect their chicks. Handled young, the Japanese Bantam tames easily. Japanese Bantams has seventeen different accepted varieties. They all weigh approximately a pound with large upright tails that reach over their heads; large combs, wattles, and earlobes; long wings that touch the ground; and very short legs. Genetically Japanese Bantam chicks have a slim chance of meeting breed standards. One fourth of them die in the egg. Another fourth have legs too long for breed standards. Japanese Bantams have a broad build and with the short legs tend to waddle like ducks. Keep your Bantums clean. Only let them outside in warm, dry weather. Their short legs keeps them close to the soil. Wet soil will end up mud in their feathers. Caged Japanese Bantam should have clean bedding at all times especially for show birds. Make sure the coop remains warm, dry, and well ventilated. Feed your Bantum food sized to their stature. Food too large for the Japanese Bantam ends up on the ground where it spoils, stinks, and attracts vermin. Remember that Japanese Bantum like all other chickens need a place to roost. 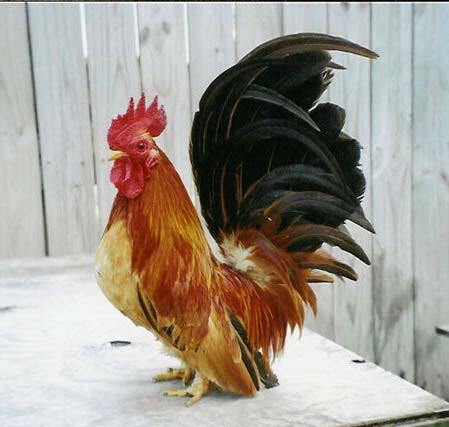 The roost protects the Japanese Bantam from dirt, mites, lice, and bent feathers.